I have been photographing the changes around Kings Cross for over a year now as part of my personal interest in the area. By the time all the changes are finished Kings Cross will not be recognisable to those who knew it 10 years ago. Photos that I have taken or will take will fit comfortably with many of the exercises for this course. When I read the requirements for the first exercise heading towards assignment three I knew the picture I wanted would be the new concourse at Kings Cross. The old concourse was not only dated but did not handle the increasing number of people passing through. Since the opening of St Pancras as an international station and the moving of St Martin's University of the arts the problems had compounded. Prior to taking the picture below I had been following the work of John Sturrock, the official photographer, for the Kings Cross project. He specialises in design and corporate work with a lot of work on building sites. Specifically I wanted to see how photographers who do this kind of work regularly handle a big area. I knew I needed a wide angle lens. Studying the work of photographers like John and other images in annual reports, brochures and the home pages of newspapers and magazines I decided to take my photo from up high looking down over the area to achieve the sense of size and space. In addition we are asked to think about what the space ought to be doing.For a railway concourse: a good flow of people, easy to see directions, easy access to platforms and for a station where people will come form around the world, a good first impression. 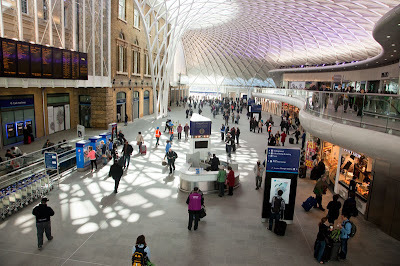 The new concourse at Kings Cross that officially opened Monday 19th March appeared on its first day to work fantastically. An impressive design, people were moving around easily without the bottlenecks of the old concourse. The departure and arrival boards are easy to see. In addition there are smaller boards strategically placed around the restaurant, cafe area. The entrance has been moved to the west side of the station so that movement between St Pancras and Kings Cross is streamlined with no stairs. This is important for two stations that connect national and international rail as well as three airports.